Hollywood has an interesting relationship with the fashion industry, concurrently reacting to and creating trends of what people are wearing in the real world. Jeans are no exception to this rule, being one of the most ubiquitous things worn in films. Everyone wears jeans nowadays. They’re pretty much the default pant option for the western world and are frequently depicted as such onscreen. The populism of denim, however, is a fairly recent phenomenon and their cultural identity has changed repeatedly throughout the twentieth century. They’ve run the gamut from workwear to high fashion, concurrently the garb of outsiders and insiders. But how did hardwearing miners’ pants become the pantheon of cool? Prior to the 1930s, denim jeans were almost exclusively limited to people who needed the hardy pants to do their jobs (miners, farmers, ranchers, etc.) and that’s exactly how it was depicted in the movies. The rising popularity of the western film, however, thrust denim into the limelight. Ironically, the cowboy era (1835-1860 primarily) and the denim era (1880 onwards) don’t overlap, but Hollywood has never exactly been a stickler for factual accuracy. The vast majority of westerns at the time were throwaway B-movies—the kind of stuff that would go straight to video if it were made today. In 1939 however, visionary director John Ford brought the same budget and story of a studio tentpole to the genre in his film Stagecoach. It was a smashing success and made the relatively unknown John Wayne a star. Wayne wore 1938 Levi’s 501s and historically accurate or not, his outfit would typify a generation’s image of the cowboy. Westerns soon took off as one of the most popular genres in American cinema. Every boy wanted to wear jeans to look like their screen idols, but they were still seen as a costume, something well-to-do Americans only wore on dude ranch vacations. That association wouldn’t last for long. A much larger portion of adults in the United States would wear denim while working in the factories during WWII. Afterwards they were expected to shed this layer and rejoin peacetime society and fashions. Some people, however, just couldn’t take them off. Continuing to wear jeans in the post-war era meant refusing to reintegrate into mainstream society and consequently a rejection of social norms. Beat poets like Jack Kerouac and Allen Ginsberg wore denim as a kind of anti-fashion statement. Others formed motorcycle clubs and drifted from town to town in jeans and their GI leather jackets. Touchstone works The Wild One (1953) with Marlon Brando and Rebel Without a Cause (1954) with James Dean captured that anti-social biker attitude on film, and put this relatively underground subculture in front of every teenager in America. Dean and his gang intimidating townspeople. The jeans and slouchy postures purposefully accentuate the lines of their legs and hips. Brando wore Levi’s 501s and a Schott Perfecto, Dean had on Lee Rider’s 101 and a red windbreaker in arguably the most iconic denim fit in history. Jeans in westerns were heroic and honest, but Brando and Dean made them dangerous, rebellious, and sexual. This devil-may-care style resonated with many teens thirsting for adventure in small town America. The look had a lot of appeal, but was still too transgressive for most people to emulate. One man, however, would make jeans so popular that rebellion became mainstream. Elvis Presley’s musical film Jailhouse Rock (1957) saw the King in all denim as a prison inmate with a golden voice. His hip-gyrating antics were a national sensation, and every teen in the country wanted the same jeans. The hips that inspired a generation! 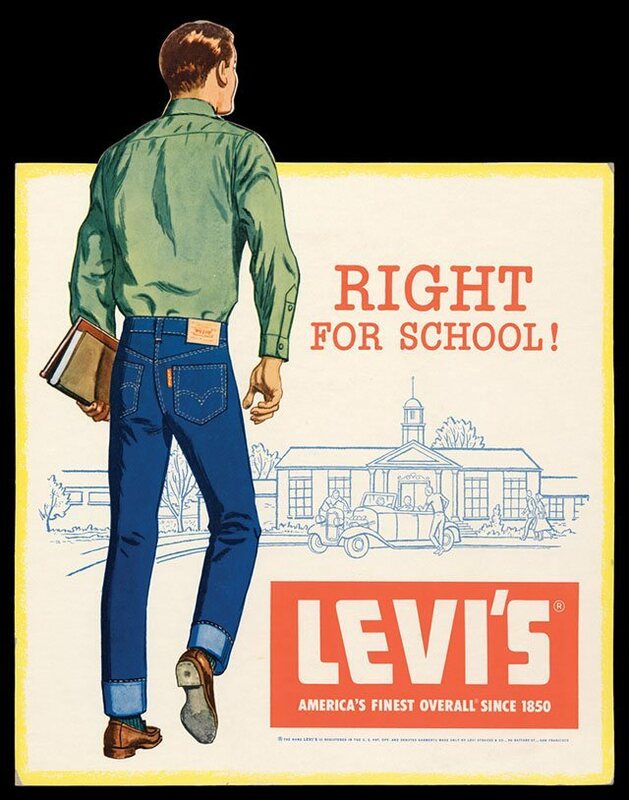 Levi’s saw the vast potential in this new market and released a line of black Elvis Presley Jeans. Now everyone could dress up like an anti-social outcast in the same way they dressed up like cowboys! Denim sales quadrupled between 1957 and 1960 as more and more young people took the plunge. Conservative parents, however, feared the implications of denim’s newfound popularity. Many school districts banned denim and jeans on screen were typically consistent with a character marker for troubled and delinquent youth. A 1959 film about denim-induced teen pregnancy was even called Blue Jeans and in the 1964 episode of The Twilight Zone, “Black Leather Jackets”, three denim-wearing young bikers are actually aliens sent to destroy the world. Based on a play of the same name, “Blue Denim” depicts two ordinary suburban teens, but when one of them starts wearing jeans the clothes start coming off and people start getting pregnant! Rowdy teens or malevolent aliens? Both were equally frightening to 1960s audiences. The denim and cotton companies fought back by forming The Denim Council, which produced ads, billboards, and other propaganda that jeans were “Right for School” and that dungaree-clad young people were still model citizens. The Denim Council didn’t really affect much at all, though, and jeans kept their edgy cool. Throughout the late 60s, Clint Eastwood turned the John Wayne cowboy archetype on its head as an amoral antihero in Sergio Leone’s “Dollars” trilogy. The Man With No Name was quick to violence, anti-social, and wore tight blue jeans. The Hollywood establishment initially decried the excess of these revisionist “spaghetti” westerns, but their popularity pushed the big studios to produce equally violent films. Ironically, Clint would also play the reactionary antithesis to jean-wearing outsiders as hard-boiled police inspector Dirty Harry (1971). Harry’s wardrobe consisted of tweed sportcoats and khakis and he was willing to overstep the law if it meant bringing punks like the psychopathic Scorpio killer to justice. Scorpio, you guessed it, was the jeans and work boots type. But that image couldn’t last forever. Denim’s aggressive masculine identity began to erode near the end of the 1970s, taking a real turn with a little film called Grease (1978). The movie simplified the angry, alienated characters and setting of earlier films like Rebel Without a Cause into a fun, choreographed sing-along. John Travolta’s Danny Zuko may have dressed like Brando’s The Wild One, but he lost any potential menace with the opening bars of “Summer Nights”. “Grease” subverted the imagery of 1950s biker movies by turning it into family-friendly musical. Compare this image with the one from “Rebel Without a Cause” above. This shifting image reflected a change in the way Americans wore jeans. Lee, Levi’s, and Wrangler weren’t the only players in the game by the early 80s. Pure fashion brands like Calvin Klein, Guess, and Jordache had stripped away the workwear edge and made denim much more accessible and wearable to non-working class Americans. Everyone began to wear jeans and thereafter any statement one could make by putting them on faded away. They were just pants. In the 1983 film Risky Business, Tom Cruise plays Joel Goodsen, a preppy upper class teenager looking for a good time while his parents are on vacation. His most iconic moment may be wearing no pants at all, but for the rest of the movie he wears both Levi’s and Lee’s. Goodsen is a rich, popular kid; the kind that would have looked down on or feared classmates like Dean’s Rebel or Brando’s Wild One and their dirty dungarees had he been born three decades prior. Now he sported their jeans with a pair of boat shoes. Denim had come full circle. Films today can still evoke that outsider working class cool by dressing their characters in denim, see Ryan Gosling in Drive (2011), but it’s much less common and the connection isn’t nearly as explicit.